SABIC’s Innovative Plastics business announced the first application of its LEXAN™ THERMOCLEAR™ polycarbonate (PC) multi-wall sheet in a Brazil sports stadium, the new Arena do Grêmio, a multi-use, 60,000-seat stadium in Porto Alegre, where the custom-colored 10-mm material is used for the roofing. SABIC’s LEXAN THERMOCLEAR sheet was chosen for its light weight, toughness and impact resistance vs. glass. This tough roofing material proved itself even before the stadium was completed when the partially installed roof was undamaged during a violent windstorm. This project represents a new milestone in SABIC’s four decades of success in delivering state-of-the-art materials to help designers and architects ensure safety while creating a major architectural statement. LEXAN THERMOCLEAR sheet was supplied in a custom blue tone matching the Grêmio team brand. The light color and highly reflective surface of the sheet help minimize the effects of heat and reduce the need for cooling systems. 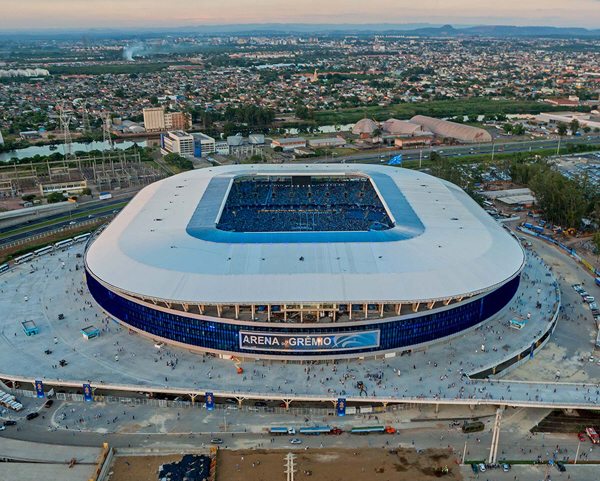 These attributes, together with the light weight of the panels (2.2 k/m2), make a contribution to the reduced environmental impact of Arena do Grêmio, which is expected to receive Leadership in Energy and Environmental Design (LEED) certification from the U.S. Green Building Council. LEXAN THERMOCLEAR sheet offers many advantages over conventional materials such as glass. It is safe and easy to handle, cut and install, and is virtually unbreakable. Its light weight can offer significant savings in terms of transportation costs, handling and installation. When compared with 6-mm wired glass, 10-mm LEXAN THERMOCLEAR sheet offers weight savings of more than 85 percent. LEXAN THERMOCLEAR sheet delivers outstanding impact performance over a wide temperature range, -40C to 120C, and also after prolonged outdoor exposure. It can withstand harsh weather conditions as well as temperature swings without breaking or buckling. It features a proprietary surface treatment on one side offering excellent resistance against degradation from ultraviolet (UV) radiation. This material carries a 15-year limited written warranty against discoloration, loss of light transmission and loss of impact strength due to weathering. The SABIC team in Brazil provided wind load simulation, mechanical resistance calculation for the aluminum profiles and flame resistance regulatory reports. For additional information on SABIC’s multi-wall sheet products, please go to www.sabic.com/sfs. For technical product inquiries, please contact us at www.sabic-ip.com/prtechinquiry. • SABIC should be written in every instance in all uppercase. SABIC recorded a net profit of SR 24.72 billion (US$ 6.59 billion) in 2012. Sales revenues for 2012 totaled SR 189 billion (US$ 50.40 billion). Total assets stood at SR 338 billion (US$ 90.13 billion) at the end of 2012. SABIC’s businesses are grouped into Chemicals, Polymers, Performance Chemicals, Fertilizers, Metals and Innovative Plastics. SABIC has significant research resources with 17 dedicated Technology & Innovation facilities in Saudi Arabia, the USA, the Netherlands, Spain, Japan, India and South Korea. The company operates in more than 40 countries across the world with around 40,000 employees worldwide. SABIC’s Innovative Plastics business is a leading, global supplier of engineering thermoplastics with an 80-year history of breakthrough solutions that solve its customers’ most pressing challenges. Today, Innovative Plastics is a multi-billion-dollar company with operations in more than 35 countries and approximately 9,000 employees worldwide. The company continues to lead the plastics industry with customer collaboration and continued investments in new polymer technologies, global application development, process technologies, and environmentally responsible solutions that serve diverse markets such as Healthcare, Transportation, Automotive, Electrical, Lighting and Consumer Electronics. The company’s extensive product portfolio includes thermoplastic resins, coatings, specialty compounds, film, and sheet. Innovative Plastics is a wholly owned subsidiary of Saudi Basic Industries Corporation (SABIC).